Visit the John Stanford Center for Educational Excellence during normal business hours to view the materials in person and fill out a feedback form. Materials are on display and forms are available in two locations: the School Board office on the first floor and the Professional Library on the second floor. Access the materials online. Click HERE for our adoption page, which provides links to PDFs with access instructions from three of the four vendors. The page also offers links to surveys identical to the printed feedback forms available at the Stanford Center. These may be used to provide feedback for the online materials. I'll have to ask why one vendor's materials are not available online. Flamin' Hot Cheetos a "smart snack?" Apparently so under new Obama administration school food guidelines (and tweaks of the snack by Frito-Lay). Interesting article about the "Minneapolis Miracle" in The Atlantic including how that city has spread the wealth in jobs, low-income housing and yes, good schools. Why tell the truth about Common Core? That's a good question for OSPI's Ready WA organization. They say - in a multi-language handout - that "The standards, which set learning expectations for students at every grade level, have been developed and voluntarily adopted by more than 40 states." That's some wordsmithing there because all they really say is "standards were developed" and then lead you think it was by the states. No, those standards were NOT developed by the states and it's wrong to say they were. The standards were developed by two private state leaders organizations via Bill Gates' money. I went to the BTA IV meeting at Nathan Hale last night. Not so helpful and a lot of bland talk. More on this in a separate thread. I titled this thread "Early Warning" because I believe we are starting to see the signs of some major upheaval. First, I'd like to just take a pulse about opting out. If you feel comfortable, could you comment if you are opting your child(ren) out of the SBAC and at what school (or, if not the school, the region - NE, NW, Central, WS, SW or SE)? You don't have to give grade level, gender or names, of course. As well, let us know if this is a source of open discussion or quiet discussion and if you are getting pushback from staff. Next, I believe the Charter Commission will be releasing a statement soon - probably in the next couple of days - that they will either be suspending First Place Scholars' charter or closing it down entirely. This will be sad but my impression is that the new Board/Director at First Place have not been able to meet the requirements set out by the Charter Commission when FP was placed on probation. Lastly, below is a letter from Chief Sealth teachers to the Nathan Hale Community. It is a beautifully written letter and it has some key points that I want to pull out. To note about tomorrow, Monday, March 30th, it appears there may be a large number of teachers who may go to Olympia to lobby against SB 5748. This is the bill that would likely get Washington State back its NCLB waiver and give those districts control of some Title One dollars. It would also start us down the road of including high-stakes testing in teacher evaluation. So if your school sees a couple of subs coming in tomorrow, that's probably why. This is a guest editorial from Palo Alto On-line,from a junior at a high-pressure high school who has much to say about the nature of public education. And yes, I know if you read this, you might roll your eyes and think, "white people problems." But despite Palo Alto being a wealthy area, talking about teen stress and pressure is important no matter where a student lives. It is about what we are doing to kids, their joy of learning and the nature of learning. Middle school didn't get any better. At the end of sixth grade, we were placed into either Pre-Algebra or Pre-Algebra Advanced, though nobody referred to the classes as such. Any math class without the word advanced in it was referred to as the "dumb" math lane (a label that has followed into high school math courses as well). I like to think of this as the reason I lost my enthusiasm and confidence for math so early -- how could I possibly feel intelligent when the class I was in was considered dumb? I want students in this district to be content, enjoy their lives, and view our schools as places where they can come and receive legitimate support for any of their problems. And, let me make clear, I understand that not all problems relating to suicide and depression are directly correlated to school. How Would You Like $5,000 to Spend on Your Child's Education? UPDATE: in a quick 3 minutes, here's why this is a bad, bad idea. If you want public money going to private schools - that have NO accountability to anyone and can pick and choose who gets in (and who gets kicked out), then you'll like SB 6079. A big no from me. A late dropping bill that missed my notice is SB 6079 by Senator Michael Baumgartner (R-Spokane). It would allow families to choice to get $5K of the average $7400 in state dollars per student. Then you could use the money for "educational services" at public or private schools. This bill is listed as first coming into the Senate on March 9th and, as of today, was referred to the Early Learning &E-12 Education Committee. Apparently, there it sits. This voucher nonsense is happening in a number of states mostly around special ed or ELL students. Naturally the hope is to expand this crazy quilt idea for all K-12 children. You could either get a voucher (and go shopping), a tax-credit scholarship, or get an individual tax credit. It's all about choice, right? Hoping this one will die a quiet death. "How SPS gets enrollment predictions so close to the mark"
Yes, that is the title of a story at the district's homepage. I will try to stifle a smile as this has not - to terrible effect - always been the case. Here's the link to the entire story. I note that the brag in the story is how close they get. What's puzzling is that at the Work Session on the budget this week, there were repeated references to the projections for this year being off. Not sure how to reconcile the two thoughts. Update: I have attempted to get rid of the annoying CAPTCHA feature. I'm hoping it works but that we don't see a lot of spam because of it. I know if I found it annoying so did my readers. Let me know how it goes. Update on SBAC from SPS Communications: our assessment folks have communicated to principals that they may use the form or accept any signed refusal. I will have a follow-up to the SBAC opt-out form. I sought clarity from the district, got it partially and am now awaiting a response. The House budget will come out today but the hearing has been moved to Monday. Healthy Student Survey results - I haven't had time to read it in-depth yet. The Charter Commission is having a special phone-in meeting today. It's an interesting thing - they will go into Executive Session to discuss a "legal matter" with no final action taken. Then, they will go back to having a public meeting if there are any "action items" from the Executive Session. I will venture to guess this is about First Place and whether they have done what the Commission wanted them to in order to remain open as a charter school. My guess is no. I believe if the Commission is to close the school, they would have to take a vote in an open meeting. Interesting map of the opt-outs in Ohio for the PARCC testing. Have you played the latest parlor game? keeping count of how many editorials/op-eds the Seattle Times prints about how important it is to get the NCLB waiver back, how its loss is hurting kids and, oh, by the way, it's "just closing a loophole" according to Rep Chad Magendanz at Facebook and the authors of the latest op-ed, Senator Mark Mullet and Senator Jamie Pedersen, say the changes would be "modest" and make it sound like simple wordsmithing. The Senators say that $1M in Seattle funds has been spent on private tutors in an "uneven way" (fewer than 500 kids received private tutoring out of an eligible 20K). Well, who's fault is that? I'd guess the district didn't bend over backwards to tell parents. But, as Superintendent Nyland DID say at the last Board meeting, it was a good thing for those parents who did get tutoring for their children. Sadly, not one word in this opt-ed about McCleary. Priorities,kids. Friday funny for your tweens and teens: a cover of 'Uptown Funk' by Voldemort. It has come to my attention that just submitting a signed, date form requesting your child to opt out of SBAC testing may not suffice at some schools. Families who refuse to allow their children to participate in assessments, including Smarter Balanced, must submit the refusal in writing, signed and dated, to go in the student's permanent record file. Parents or guardians must submit this refusal annually. Families may use THIS FORM or submit a clear written and signed document. That's rather interesting wording in red as I might perceive they mean it has to be hand-written, not typed. Why that would be, I don't know. Here's the SBAC page at SPS. I note that when you hit the spot for the form to refuse, it does NOT take you to the form. It takes you to yet another page. Here's the link to the SBAC form. In the SBAC form, I'm supposing they want you to realize, in humiliating detail, how you are failing your child. I also have to laugh at stating "my reason" - honestly, it's not SBAC or SPS' business. I will ask if the SBAC form is the only one being taken by schools or are principals allowed to make anything up that they want. On the eve of the first budget coming from the House is the latest NY Times Room for Debate section on "Is Improving Schools All About Money?" I'll just simply say - after sitting through the Board Work Session yesterday that included next year's budget - yes it does. But it matters HOW the money is spent (and SPS is a baffling example). Naturally, as we wait for enactment of McCleary, it is also about fully funding basic education (which is not happening in our state). My favorite in the NY Times bunch is Lisa Delpit "Can we put the money to better use?" and her analogy of a gym membership. Last night at the SPED PTSA meeting, the SPED Dept leadership said that SBACs cannot trump the law in regards to our students' SDI, that is, whatever the time crunch of SBACs, students' SDI still needs to be delivered per IEPs. The SPED Dept leadership stated that they'd reached out to principals to ensure that master schedules are being created to ensure that no student's SDI lapses during the SBACs. Well, that's what me and many others are calling what is happening to one 6th grader in Libertyville, IL. On the first exam day, he had to sit in the testing room with his peers but do nothing. He couldn't read, draw or do anything for at least two hours and 40 minutes, double the time of the 80-minute math test. Why did he have to sit double the time? By law, Sam is allowed extra time to complete some school tasks, such as standardized tests, because of his academic challenges. The school reasoned that had the boy taken the PARCC exam, he would have been given an extra 80 minutes to finish, and therefore he sat for the length of the test plus the additional time. The House will be releasing its budget tomorrow with a public hearing on it also that day. Naturally, this is a greatly anticipated moment for public education because the question is: what's in there for McCleary (and how are they paying for it)? What is vitally important to let legislators know is that McCleary is about several things. fully-funding to whatever they are defining as "basic education"
remembering that class size IS part of McCleary (especially at K-3) and any attempt to say that they can't fund 1351 would not be true (given the first part of my statement). You cannot divorce class size from McCleary. What was clear from the Town Hall at Hale on Saturday is that even the biggest legislative supporters of public education have no time/stomach for figuring out funding for 1351. The Class Size Matters folks are encouraging people to attend the hearing tomorrow, Friday, March 27th at 1:30 pm in the O'Brien House Office building, Room A.
I'll put a notation by each of these; please consider contacting your legislative reps for your support or rejection of each bill. Honestly, I think sometimes the Times does not think much of its readers. For many of their education stories, they always manage to leave out very basic information. Almost as if they wanted to slant a story. The latest laugher comes via Washington Stand for Children and their "petition" to the Legislature over voting to link test scores to teacher evaluations. The House will have a public hearing on their bill on Monday. Along with supporting this bill, Stand for Children, one branch of a national advocacy group, has also lobbied for stricter teacher evaluations and more school choice. The group collected the 20,658 signatures mostly online over the past year, said spokeswoman Jeanette Lewis. It vetted the signatures by deleting those with duplicate or invalid email addresses. What's missing - from a reporting standpoint - is not truly explaining who Stand is and who funds them (Gates). I note the Times uses the cagey "nation advocacy group" and NOT "parent advocacy group." Why? Because it's not. Rainier Beach High School students are transforming the very nature of education inSouth East Seattle. Equipped with the new International Baccalaureate Program and their personal experiences as educational muses, our youth are surging ahead to become some of the most potent global leaders in the region and beyond. A cohort of students have been selected to pursue a unique opportunity in Barcelona, Spain this summer-- the International Baccalaureate World Conference. For a week in July, these students will join 200 other change-makers from across the world in Global Action Teams to examine the theme of "Technology in the Global Society". The Board is having a multi-topic Work Session today with an update on the Families and Education levy, more Board policies and a presentation to the Board on the 2025-2016 Budget. I don't know if it's because I don't read many budgets but I am finding this presentation documentation hard to understand. It appears - on page 10 - that the district is trying to pay for "strategic initiatives/grant backfill" to about $5M. Seems like a lot given that's money that is NOT going to the classroom. What is also troubling on that same page - if I am reading it correctly - is that the district says the "materials, supplies, operating costs" are at $20.3M. And yet, they will get $16.5M from the Operations levy. Obviously the two numbers are not equal but the problem for me is that the district gets money from the state for operations. If there is state money plus local levy money, how are they not able to corral the $20M? They say they have a budget gap of almost $11M. And look at page 16? Guess who is in a little "cloud" as a resource? PTA. Yes, folks, the district is counting PTA funding as a resource (and apparently, a continuing one). THIS IS WRONG. That kind of thinking is magical thinking because there is no guarantee any given PTA can continue its funding and/or might not change their minds about it. A couple of things that may extend beyond one school - if you know this is happening at your school, could you please let us know. Update: on the SAT testing story, at the end of the thread is a letter from Roosevelt principal, Brian Vance. In the following weeks we received no indication that there would be a consequence for our timing error and even after speaking with College Board and Educational Testing Services after the exam, we received no information that would lead us to believe they would invalidate the test scores. The first indication that there was an issue came last week, when students were not able to access their scores. In the end, the College Board invalidated our students' scores. It sounds like RHS was trying to figure it out but the College Board took their sweet time in making a decision. Not good. Evidently, at Roosevelt HS, the proctor made a timing error on the first section (10 minutes extra time), allowed the rest of the test to continue, and then reported the irregularity to ETS. There has been no public acknowledgement by the RHS principal of this error. I am hearing now that all of those students' scores are being invalidated. Do any of you know whether this error occurred at any other SPS high school? Such a large number of students are affected by this, and the College Board's response is to offer a retake on May 2nd, the weekend before many 11th graders will also be taking AP exams. How fair is that?! I am waiting for confirmation from Communications on how many students were affected, is this a one-off situation, have students received notification, etc. Second, I received a heartfelt e-mail about cuts to school funding from a parent at Orca K-8. This is not the first school I have heard from and, together with the seeming "caps" on enrollment (see Cleveland), I have to wonder if the district is somehow trying to deprive schools of money to pay for other things. Opt-out information in Spanish (thanks to a Spanish-speaking parent). Please share with others. Here are the toplines. The district is to have a press conference on Thursday that I hope to attend and the survey with all results will be released then (bold mine). Too Bad Your Kid is "Average"
How does that really help a student and how do you think your child would feel? I know my sons liked a challenge but I also know that they both would have rushed to finish, maybe even guessing answers because they would not have wanted to be thought of as "average." The first of the community meetings around BTA IV coming up in Feb. 2016. It's at Mercer Middle School, 1600 S. Columbian Way from 6:30-8:30 pm. There is also one on Wednesday at Ballard High School, 1418 NW 65th St from 6:30-8:30 pm. There are more next week at other locations; see the district calendar. · The Stanford Center is close to the center of our large city. · It offers desks and chairs for students and waiting spaces for families. · As opposed to using a school, it means we do not have to burden a school staff with staying late for the testing. · The afternoon times prevent students from missing school. · The variety of dates allow families to select one that they can make work. The Stanford Center was the location used for testing last year and many families dropped students off for testing and walked up to Starbucks for an hour; others dropped students off and waited in the common spaces. To my knowledge we had no complaints last year that the location was challenging. I would say that I would not consider JSCEE to be near the center of the city. I continue to think two sites - one to the north and one to the south would have been a better and more equitable. Call me crazy but I believe most schools have desks and chairs and waiting areas. I agree that after-school makes the most sense but around rush hour/dinnertime would not have been my pick. Unhappy with Pearson? Apparently you are not alone. Speaking of Big Brother, here's the SBAC's "Guidance for Social Media Monitoring during the Field Test." The State Senate is to drop its budget this week. Let's see how that fulfillment of McCleary is going and where they find the funding. I spoke to Speaker Chopp last week and that's pretty much all he would say. I note that when I mentioned that while I think preschool is great, that the Constitution says K-12 is the state's paramount duty and that I was worried about the push that both preschool and higher education are receiving this session. He said something to the effort that there would be more dollars for preschool but not in McCleary. Whether it's in McCleary or not is not really the point. Because, frankly, education dollars are education dollars. I note that there's a new group, Why Not Us Washington that is pushing the Legislature to invest more in preschool. It's a group of child advocacy groups sponsoring this group that looks like it's mainly MomsRising. Interesting thing - preschool isn't even listed as one of Moms Rising's main issues. Oh wait, it's also sponsored by LEV. Congratulations to Physical Ed teacher of the year (according to SHAPE America), Shelly Ellis. Ms. Ellis teaches PE and Health at Broadview-Thomson K-8. And good luck to the Franklin Mock Trial team that is headed to the state competition this Friday. They have been past state and national champions. They took second this year to rival Seattle Prep at the county level and hope to best them at state. BUT very big news - this bill being introduced through the House and seemingly on track to pass both House and Senate quickly has now been pulled back. The reason seems to be the overwhelming unhappiness from (real) data privacy groups and parents. What are the impacts on our region’s diverse schools and students? Absolutely hilarious blog thread from a woman calling herself the "FERPA Sherpa" and saying she's for student data privacy about Pearson and their interception of a student's tweet on the PARCC test. Have we stopped to think if students care or, dare we say, expect it even? You see, as adults we can express our outrage over a multinational corporation monitoring students but are we speaking for students or for ourselves? Is this our outrage or the students? K-12 students think differently. They expect to be watched by their teachers, parents, peers etc. but certainly do not expect companies monitoring social media to see who mentioned a test. And here is where it gets interesting. I asked some 5th grade students how they would feel if they posted something online and it became public information. They said that everything they do is seen by their parents and their parents are always posting things about them anyway. They expect someone to be looking at what they do all the time. So have we conditioned kids to expect to be monitored and tracked? Have we unconsciously blurred the lines between private and public for kids so much that they expect to be watched all the time? We have created an atmosphere of mistrust because we don’t trust the education and technology sector. WE created this mistrust? Or was that Pearson and Bill Gates and InBloom? Testing - What Will You Do? Until students' education has been guided by the new standards and schools have practiced administering and interpreting SBAC, the results will not support reliable and valid inferences about student performance and should not be used as the basis for any consequential purpose. Unless empirical studies confirm a sound relationship between performance on the SBAC and critical and valued life outcomes ("college and career-ready"), test results should not be used to make consequential judgments about schools and students. We believe standardized tests play an important but limited public assurance role in education. Well-designed tests can help evaluate greater equity of outcomes for our students. Educators can use tests to set realistic targets for improvement. Test scores can be a trigger for detailed evaluation to learn what schools are doing very effectively or to help identify strategies schools can use to get better. However, there are real limitations of what can be concluded about learning based on test scores, particularly in the first years of new tests and standards. Students this spring will be tested as if they had Common Core-aligned curricula for their entire educational career. While schools have secured sufficient capacity and internet access for testing, we should not confuse this with equity across the state. Districts with more access and whose students have more familiarity with technology will find it easier to administer these tests. Will the tests measure reading and mathematics or will they measure computer access and literacy? Over time, the computer adaptive tests will likely be better than their predecessors as they hold strong promise for individualizing and testing knowledge in applied settings. This is an improvement from other tests, yet it is a substantial change and, therefore, SBAC scores cannot be compared with earlier NECAP scores. One reader sent along to me a response to her e-mail to Senator David Frockt over his vote on Senate bill 5748. I'm printing it in its entirety below. It is nuanced and carefully thought out. I believe the Senator is probably speaking from a position of good faith in what he believes this bill to be. Unfortunately, I do not share that trust/comfort that this bill is merely a way to get back the NCLB waiver. If you read his letter, it seems like he thinks it does almost nothing and, of course, that makes no sense because no one created this bill just to do very little. I finally finished the notes I had taken on the first hour+ of the latest School Board meeting. I think it worthy reading for several issues. That last one is pretty eye-opening as it featured a last-minute change to the MOU, a blank space for the dollar amount on the lease document, and a question about any religious connections for this learning center that Africatown is running. Very odd and very troubling. I'm think there could be a variety of education topics including SBAC (given it's at Hale). As well, if David Frockt shows up from the 46th that could be interesting given his support of the Senate bill that includes test scores for teacher evaluations. I don't think we should demoralize our students by giving them a test where the test makers have already decided that 60-70% of our students are going to fail." I won't debate this issue of whether the test makers meant "fail" rather than not pass but I give Principal Hudson credit for speaking out. Also in the newspaper, a student speaks out about "honors" in classes and a back-and-forth about Disney princesses which is a scream. Teen Suicide Concern: "Keep Calm and Parent On"
An excellent article on teen suicide from a parent and psychiatrist in Palo Alto, California after the suicide of high school student there. What is notable about Palo Alto is that it is in Silicon Valley and both high schools have experienced a fairly steady rate of suicides over the last several years. It is an area of high expectations and high hopes and that may play a part in why teens kill themselves. There is no single cause of suicide -- the act can arise from any combination of multiple factors -- biological, environmental, psychological and situational. As a community, we agree that whatever can be done to mitigate these factors must be done; where we disagree, however, is where one might expect: What does "whatever can be done" entail? Our public debate continues -- in community meetings, in online forums, in newspaper letters, in school board and city hall meetings. But for me, on line at Starbucks, in the aisles of Safeway, at school campus pick-up or drop-off, this public debate echoes much more private and personal implorations. My fellow parents ask me in whispers: What can we do right now to decrease the risk of suicide in our children? The Laurelhurst Blog has done a notable job in covering the issue of portables at Laurelhurst Elementary. This is an issue that many schools have struggled with, both recently and long-term. Here's one school's story. The Teenaged Brain: Spock versus Kirk via NPR. Mukilteo Education Association at Mariner High School in Everett speaks out about SBAC testing of 11th graders. Look who was on both the local and national NBC news - students at John Rogers Elementary. They did a class project on who is on U.S. paper money and found not a single woman. So there's now a petition to get a woman on the $20 by 2020 (getting rid of Andrew Jackson who apparently didn't even want to allow paper money). But who? Join your neighbors for a free meal to learn about how to support the rigorous educational opportunities that Rainier Beach High School's successful International Baccalaureate Program provides. This event is open to everyone with an interest in learning more about our vision for advanced learning in the Rainier Valley. At this event, you will have a chance to see a mini-lesson led by one of the IB teachers, hear from students about their experience with the IB program, and offer input by brainstorming ways for all of us to better support our community youth. Please spread the word by posting the attached flyer (in English and Spanish) or forwarding this email to your networks! Questions? Do not hesitate to contact me, Cambrie Nelson, at cnelson@urbanimpactseattle.org. > Some of you have expressed concern about the administration of the Smarter Balanced Assessment (SBA). Concerns have included questions about the utility of the assessment, the instructional time lost due to testing and the likelihood of lower test scores. I encourage you to visit our newly developed Frequently Asked Questions<http://smarterbalanced.www.seattleschools.org/modules/cms/pages.phtml?pageid=324018&> on our district website. Hi Save Seattle Schools readers! I am a Garfield graduate now attending Rice University in Houston, TX. I am taking a class called"Black in Schools," which examines the history of and current state of education for black students in America. For my final project in this class, I need to explore issues in black education through the personal experience of a single person--a student or educator. For this project, I am interested in interviewing a student, teacher, or administrator from the now-defunct African American Academy. If there are any former AAA students or educators interested in talking to me about their experiences there—or if you know someone who would be—please contact me by phone at (206) 288-9051 or by email at jht4@rice.edu. My initial research on the African American Academy leads me to think that it might provide a very interesting perspective on some of the issues we are studying in my course, so any help would be greatly appreciated. Garfield High School Class of 2013"
Seattle Public Schools is hosting five community meetings to share information about our upcoming Operations Levy and our Buildings, Technology, Academics/Athletics IV (BTA IV) Capital Levy which will be submitted to Seattle voters in February 2016. The Operations Levy renews every three years, represents nearly 25% of the District’s annual general fund budget and supports basic educational programs not fully funded by the state. The Buildings, Technology and Academics IV (BTA IV) Capital Levy renews every six years and funds hundreds of small renovations and major maintenance projects, as well as technology, academic and athletic initiatives at our school buildings. Staff members will present information, ask for comments and answer questions. or mail to: Levies 2016, Seattle Public Schools, M.S. 22-336, P.O. Box 34165, Seattle, Washington, 98124-1165. The Superintendent - in his comments at last night's Board meeting - had very little to say about how it's going for SPS and SBAC testing. But here's one man's dissection of the SBAC math from the GFBrandenburg's Blog (he's a retired math teacher). The critique of SBAC math is from Steven Rasmussen from SR Education Associates. Mr. Brandenburg breaks it down (as Mr. Rasmussen's writing is quite lengthy but very in-depth). Ironically, while poor results on the Common Core tests will be a blow to policy makers, parents, educators, and students, they will be a boon to those in education for a profit. Now this is exactly what should be happening - a notable activity at a high school evolving to bring in more students. But these weren’t your typical drama kids. When one girl wanted to talk, she used her hands and a sign-language interpreter. Others didn’t speak at all. One girl walked slowly, her gait uneven because of cerebral palsy. They are members of a new drama group at Roosevelt, open to special-education students and their typically performing peers. On Thursday, the group will give its first performance of a play, “Voices,” they helped create. Called “unified drama,” the after-school club is based on a similar, successful sports program at Roosevelt and a similar drama class at nearby Nathan Hale High. It’s also part of a wider effort to include special-needs kids in more regular high-school classes, and regular extracurricular activities. Parents of students in Seattle Public Schools will attend the school board meeting this afternoon to express their frustration that the district has failed to act on their requests that the district provide their children with enough time to eat lunch and play at recess. They are asking the district to quickly ensure that kids get more to eat and play at school. Parents also pointed to a new study from the University of Washington that found students in Seattle Public Schools get only 12 minutes to eat their lunch, resulting in most of the fruits and vegetables going uneaten and putting students’ academic achievement at risk. The school district has claimed that lunch and recess times had to be cut to meet instructional hours requirements, but parents reject that claim. “Many at the district level are blaming an increase in state mandated instructional hours, but that excuse doesn’t hold water. The increase doesn’t start until 2015-16 and only applies to high schools,” said Sarah Lang, a parent at Whittier Elementary and Hamilton Middle Schools. Jacque (pronounced “Jackie”) Coe will be recommended for school board approval on April 1, as the Chief Communications Officer for Seattle Public Schools (SPS). She currently is the Senior Director of Strategic Communications for the Washington Dairy Products Commission and is nationally accredited in public relations (APR) by the Public Relations Society of America (PRSA). Prior to joining the commission, Jacque served as the Director of Communications and Community Relations for the Bellevue School District. While working for the Bellevue School District, Jacque’s responsibilities included internal and external communications as well as community engagement initiatives including strategic initiatives, policy, public affairs, community engagement, and outreach to diverse audiences. During her tenure with the district, she re-organized Communications staff for strategic focus and enhanced customer service, redesigned the web site for easier navigation, created a district advisory committee process for greater public engagement and led team efforts in strategic planning initiatives and policy efforts. Jacque will transition into the role on Monday, April 6. This is something that seemed to just spring up on the SPS website (and I have heard that they seem to be scrambling for facilitators). Below are links to the laws enacted regarding student social media privacy. Some states cover K-12 and post secondary and others only post secondary. In general, these laws make it difficult for Pearson and schools to monitor online the students the laws cover. You may want to provide this information to the list serve in case they want to review their state's law and/or advocate for coverage for K-12 students. Seattle Audubon Society is currently looking for volunteers for our Finding Urban Nature (FUN) program. FUN introduces 3rd and 4th grade students to the interconnections between producers, consumers, and decomposers in the schoolyard habitat. Volunteers lead small groups of students through hands-on outdoor lessons. Four lessons in the spring and four more in the fall give students a chance to fully explore the schoolyard habitat, proving that nature is around us no matter where we live, work, and play. We serve 12 Seattle Public Schools located throughout Seattle. -The FUN program relies upon 120 volunteers each school year. We currently still need almost 50 volunteers to meet our needs for the spring 2015 program! -Volunteers devote about two hours a week for four weeks in the spring and/or fall. -Volunteers lead a group of 4-6 students through each lesson with the support of the school's FUN Team Leader and classroom teachers. -No previous teaching or science background is required - and volunteers often report that they have as much fun and learn just as much as the students do! -Apply as soon as possible to be a part of spring FUN starting in April! -Training sessions will be held on March 24th, 28th, and 30th. Reply NOW to get more information and to sign up for a training session! Six questions for Secretary Duncan about teacher evaluations. The Times tries to defend Common Core. The Times pushes against "ideologies and alliances" in bills in the Legislature for teacher evaluations. Updates coming on tomorrow's Board meeting. The Times owns up to something good happening in Seattle Public Schools (without charters or a state turnaround order). Tangled in bureaucracy and tradition, public schools need years — often the better part of a decade — for real turnaround, so skeptics may wave off the spike in graduation rates at Rainier Beach High as a mere blip. Or ignore its ballooning enrollment. Or shrug at the dozens of students on track to leave with college credit for advanced studies. No marker is more stunning than Beach’s 25-point increase in graduation rates since 2011. Last spring, 79 percent of seniors left with a diploma — better than the 74 percent district average. Seattle Public Schools does not consider the program part of the district’s official Advanced Learning options, and has no plans to fund IB beyond the startup grant that Rainier Beach will exhaust in 2017. Apparently, the student had just commented on the question after taking the test, and deleted his tweet after being contacted by the district. In addition, Pearson/PARCC has access to if a student is using testing modifications, along with their names, unique identifier numbers, etc. Beyond sensitive student information, Pearson also collects everything a student types into the keyboard during the test including words or sentences that were typed and then deleted. Pearson knows whether or not the student views a test item, how long it takes him/her to answer a specific question, and it tracks the student's clicks as he/she navigates the test. This seemingly harmless data, when paired with sensitive information about an individual student, creates a very complex learning and behavioral profile of the child. Big Brotherism on the part of the Pearson educational company has led to charges that they are "spying" on the social media postings from students particularly in New Jersey. Those students are taking the PARCC test that Pearson produces. Pearson, the world’s largest education company, is monitoring social media during the administration of the new PARCC Common Core test to detect any security breaches, and a spokeswoman said that it was “obligated” to alert authorities when any problems were discovered. I am sorry to report that a Cleveland high senior, Robert Robinson, Jr., was killed Sunday afternoon by a drive-by shooter. He was shot walking thru his neighborhood around 4 pm. Police are asking anyone with information about the shooting to call 206-233-5000. Remembering Robert Robinson: students/staff to hold school-community-only, open mic vigil on Thurs 6:30 pm. Ding dong, the bill to split Seattle School district died in the Rules Committee. I heard this on KUOW this morning and was surprised to hear that one of its creators, Sharon Tomiko Santos, said it would have benefited all students in SPS. This was the first time I heard that reasoning advanced and yet if that's what they thought, they could have explained how that was. Reports of shots from a BB gun fired at a school bus near Martin Luther King, Jr. Elementary are being reported in the Seattle Times. It happened yesterday around 4:30 pm. The school had been under lockkdown for some period of time but then the students were allowed to go home. No one was hurt. I'm off in a few minutes to the press conference right by Roosevelt High about the blight around there by the infamous Sisley brothers. Hoping there is some relief in sight. As many readers have reported, seven Democratic senators, in the Washington State Legislature, including three from Seattle, voted to move forward a bill (SB 5748) that would tie student test scores to teacher evaluation. The vote was 26 yeas to 23 nays. I had been wondering where the agenda for tomorrow's Audit and Finance Committee Meeting was. Well, now I can see why it was delayed. 2) It's a mess. Literally. Things added links not there - very confusing. Yesterday, some staff members were unable to log into the SchoolFusion websites. We believe this issue has been resolved and all staff should be able to log in. If not, please let us know. Today due to some remaining export/import issues students may be having trouble logging in. We are working on this issue with our vendor and expect to have it resolved by tomorrow. I noticed that the Tuesday Open Thread is chock-full of concerns and complaints. Most are around the pending SBAC testing but others are more basic. So, as a public service, I'm going to open this thread up for more of those. And, in a couple of days, I will forward it to the Board. It would be helpful if you at least identify your region (possibly school?) so that Directors get an idea who's writing in. Two SPS students were named Regional Award winners at the Regional High School Art Show that is sponsored by the Puget Sound Educational Service District. Those students are Ava Code-Williams from Garfield and Huo Xian Wu from Franklin. I love Code-Williams' haunting "You have your mother's eyes." SPS was also awarded a 2014 Gold Star by Governor Inslee for getting students signed up for the College Bound Scholarship program. SPS signed up 100% of eligible 8th graders. Yesterday was the Curriculum and Instruction Committee meeting. I wasn't able to go but I know that Director Peters was going to try to get the SBAC issue on the agenda (as she was told to do at the Board meeting). I don't know if she was successful. I note that League of Education Voters (and other groups like the faux Our Schools group) are heavily pushing pre-K. This is fine except that LEV was one of the plaintiffs on McCleary which is about K-12. Anyone watching public education in this state can see that there is now this movement to include pre-K AND higher ed in McCleary. I do believe in the continuum of pre-k to higher ed but I also believe that since it is K-12 that is the state's primary job (and the state constitution), that the follow-thru needs to be there first. "In the end, though, it will still come down to someone in the District leadership insisting on compliance with the law, regulations, policy, and the District's stated values. All it takes is one person." But what would it really take to foster a culture of compliance to replace the culture of lawlessness? Could just one Board member do anything? Would it require a Board majority? What would they have to do? Education entrepreneurs from across the globe are flocking to Austin this week for SXSWedu. They’ll unveil the latest in education software and talk about how to innovate and disrupt their way toward better teaching and learning. And, of course, they’ll network. The conference is always known for showcasing new ed tech products, but this year, there’s another emerging theme: student data privacy. There are absolutely a large number of student data privacy events as well as Special Ed (I didn't see any on ELL) and computer science. Seattle Opt Out Group's next meeting, with two dynamic speakers, Jesse Hagopian and Fred Hamel. We will discuss high stakes testing, what is happening in Seattle, how to refuse the tests (and why), and much more. Everyone is welcome! As was reported and discussed, Seattle Public Schools recently settled a sexual harassment suit for $249,999. This situation provides a number of examples of the District's dysfunctional culture of lawlessness. Shall we count them? The staff attempted to keep the settlement from the Board. The staff attempted to keep the settlement from the public. Rather than being held accountable for the failure at the heart of this litigation, the principal in the case was promoted - twice. No one has been or ever will be held accountable for this failure. No one has been or ever will be held accountable for trying to cover up the failure. No one has been or ever will be held accountable for trying to keep the settlement from the board or the public. This settlement will not lead to any improvements or changes in the way the District handles these sorts of complaints. No lessons were learned. The District enacted a crisis response plan for exactly this sort of public relations disaster, and the crisis response utterly failed. There will be no effort to improve that either. Think how differently everything would have been if, ten years ago, and this year, the District staff had simply followed the policy and procedure. None of this would have happened. As you all may be aware, both sides of Congress are struggling to rewrite NCLB (formally known as ESEA). It appears that AFT (American Federation of Teachers) is pushing hard with Senator Patty Murray to put in a clause about the right of parents to opt out of standardized testing. PLEASE give her office a call to let her know you support this inclusion to the revision of the law. Sample statement: "I wanted to let the Senator know that I support a clause in any revision to NCLB that would include parents' ability to opt their child out of high-stakes testing." From the Milwaukee Journal Sentinel comes news that the Walton Foundation, which has made huge "investments" into Milwaukee's public education system, is pulling out. (Thank you to reader, Dan.) This article seems to be an op-ed by a professor of law and public policy at Marquette University :aw School, Alan J. Borsuk. He is not happy. We, the undersigned teachers of Schmitz Park, join with the Nathan Hale Senate in its concerns over the validity, reliability, and equity of SBAC (Smarter Balanced Assessment Consortium) including the questionable cut score strategy. Like the Nathan Hale Senate, we are also concerned with the loss of instructional time devoted to this questionable test. We stand with you in asserting a commitment to a judicious use of valid, reliable, and equitable assessments. We urge parents to inform themselves about the tests their children are taking and the validity of those tests. Thank you for putting students first. 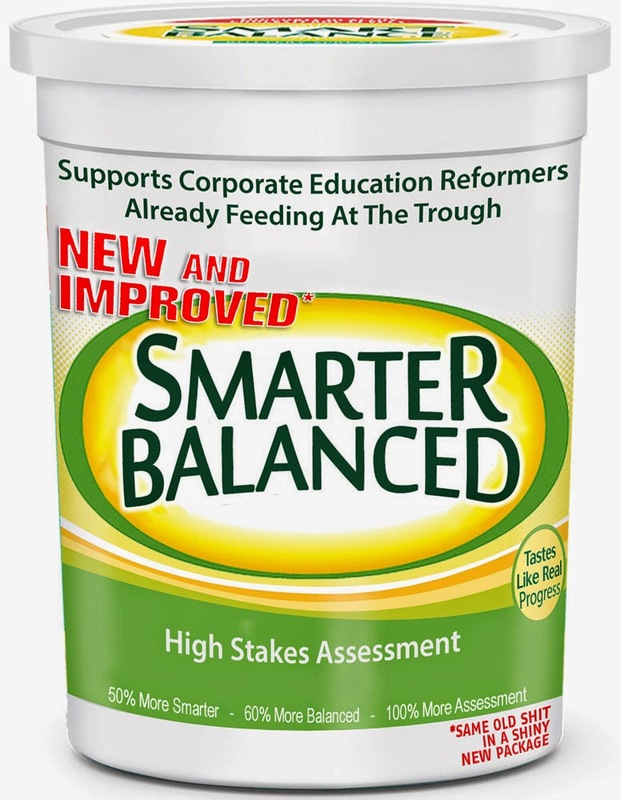 Smarter Balanced - a New and Improved Assessment? Like to impress your friends with new skills? Our summer camps introduce middle and high school students to computer science through programming projects, magic tricks and faculty presentations. Registration will be opening March 9th and closing 11:59pm on March 16th. The application will ask for the student's T-shirt size and a couple short written answers from the student. Students who register during this period will hear back by March 23rd at the latest. Read FAQs about our upcoming camps. They also include a huge list of other camps/programs with similar themes. Washington State Representative Santos was a primary sponsor for yet another nonsensical bill, House Bill 1121. Directs the partnership to work with OSPI to integrate financial ed into common core and career and college standards. Directs districts to offer a course students can take at school or home (meaning online). Districts are encouraged to grant credit. Allows the partnership to seek federal and private funds (guess who from). I am tired and so frustrated over this issue but here we go again. Seattle Schools is paying out $249,999 (to avoid hitting $250k which would have triggered School Board approval) to a former student at Eckstein who says a computer teacher sexually abused her verbally and physically. This was about the time one of my sons was there and I am appalled and saddened because I thought the teacher was a good one. Maybe he was a good teacher but this settlement seems to say otherwise. I have no idea if the Board knew this was coming. Seattle Schools: Getting a Little Worried about Opt-Outs? The district sent out this robocall today about SBAC assessments. They pack a lot into a short bit. They also say "the state requires assessments..." when REALLY what they should say is that "the state requires the DISTRICT to give assessments"- not that all students have to take them. But maybe that's more information than the district wants parents to know. 36th district 10 a.m. to 12 p.m. at the Phinney Neighborhood Association, Community Room in the lower brick building at 6615 Dayton Ave. North. This just in - it's all about the Benjamins. At least, it was to Governor Chris Christie about Common Core. We've had quite the exhaustive discussion around SBAC testing and it hasn't even started. * An assessment of children's nutrition before they come to school. * An assessment of how many times children have been read aloud to before they entered kindergarten. * An assessment on student attendance and student homework. * An assessment on children's financial stability at home. * An assessment of children's abilities to sleep each night in a loving home. * An assessment to gather data on the damage that is done to schools by politicians, CEOs and companies that lobby and manipulate schools into spending millions of dollars on products that are unnecessary, redundant and embarrassing. What do some Republican lawmakers in Minnesota want to do? Break up Minneapolis School District...into six districts. “One of the inspirations was a MinnPost interview with [departing Minneapolis school board member] Alberto Monserrate where he described the district as a bureaucratic nightmare that no one can overcome,” said state Sen. David Hann, the senate minority leader and chief author of the bill. It’s a pilot plan and not a guarantee that it would result in improvements in the achievement gap, but Hann feels it’s an option more school districts would try if given the opportunity. WHAT?! "Pilot" dividing up one district into six and see how that goes? Where's the data that shows that smaller districts are more responsive and families have more impact? You could suppose that to be the case but apparently we are a data-driven nation now so show me the data (we're still waiting for that from Pettigrew and Santos on their own bill). Interestingly, the Minneapolis School Board would decide how the breakup happens. That certainly makes more sense than OSPI and Ed districts around Washington state deciding. But, hilariously that would be six superintendents and six school boards. And "the districts would be free of state mandates." Now THAT would explain splitting a district. Speaking of legislative bills, LEV has a "bill tracker" so you can keep up with all the education-related bills in the Washington State Legislature. One interesting bill I missed is HB 1142. Like many bills, it seems to have several issues rolled into one bill. Part of the bill is pertaining to funds for student parking, either at school or at school events. This bill would force districts to put all (or at least a portion of) those fees into ASB funds. This would be a tremendous help for our high schools' ASB funding. As well, this bill also would force districts to put money from lease/rental income into debt service or capital project funds. (The current language of the RCW says "shall" and this bill changes that to "must.") Money could only go into the General Fund for maintenance or other costs associated with those leased/rented properties or could go for maintenance on regular school properties. A lot of this uproar is about technology, I'll admit that. But it further confirms that schools and districts are - not - ready. I have no idea is SPS is truly ready. But if I were a kid, siting and waiting and sitting and waiting, I think my range of emotions probably would not add a lot to the actual taking of the test. If I were a teacher, I would feel a lot of frustration and some despair for my students. And, as a parent, I would just not take any test result seriously. Maybe SBAC will do better than PARCC. Nyland: This year, the state is replacing the MSP/HSPE assessments with a new assessment called Smarter Balanced, which is aligned to our new College and Career Readiness Standards (Common Core). Staffer: The Smarter Balanced Assessments are NOT replacements for the MSP/HSPE. The HSPE was only required once in High School, at the 10th grade, and only in literacy. The Smarter Balanced Assessments are for more subjects and in more grades. The claim that the Smarter Balanced Assessments are a replacement is ill-informed at best and an intentional deception at worst. Nyland: As a tool for educators, Smarter Balanced Assessments are an improvement. They are designed to better measure student growth from year to year. They are adaptive to students' skill level and will adjust questions (easier/harder) based upon previous answers, an approach that does a better job of assessing learning of students both above and below grade-level standards. This assessment will provide diagnostics to help educators close opportunity gaps for students. Are they summative assessments, a formative assessment, or a diagnostic assessment? He seems to be suggesting that they are all three. Is this credible? And what does the Smarter Balanced Assessment tell us about the quality of instruction? Will it be used for teacher evaluation as well? What is it? A Swiss Army knife? Nyland: Smarter Balanced Assessments reflect a higher level of rigor. The new assessments measure the more rigorous work happening in our classrooms at each grade level, and at the high school level expectations increase from 10th grade to 12th grade standards, reflecting our college-ready goals. Why should the assessment be more rigorous? Shouldn’t the instruction be more rigorous and the assessment be standardized? Why must everyone be college ready? - no real direction on refusals, just directing parents to a web page. Seems like that would be a bit awkward if teachers and principals had nothing else to say to parents but "check the district's webpage." Read Across America Day, Yay! Latest on Opt-Out: Is it Legal?